During the 1930s, Stuart Davis, who criticized Thomas Hart Benton’s self-consciously American art as inherently xenophobic, and [referred to] the elongated figures in his paintings as dehumanizing caricatures, was one of Benton’s most vocal adversaries. Even so, their art intersected in many ways. Painted in 1930, Jefferson Market depicts the public space and surrounding structures along Sixth Avenue between 10th and Christopher Streets, only two blocks south of the New School’s headquarters. 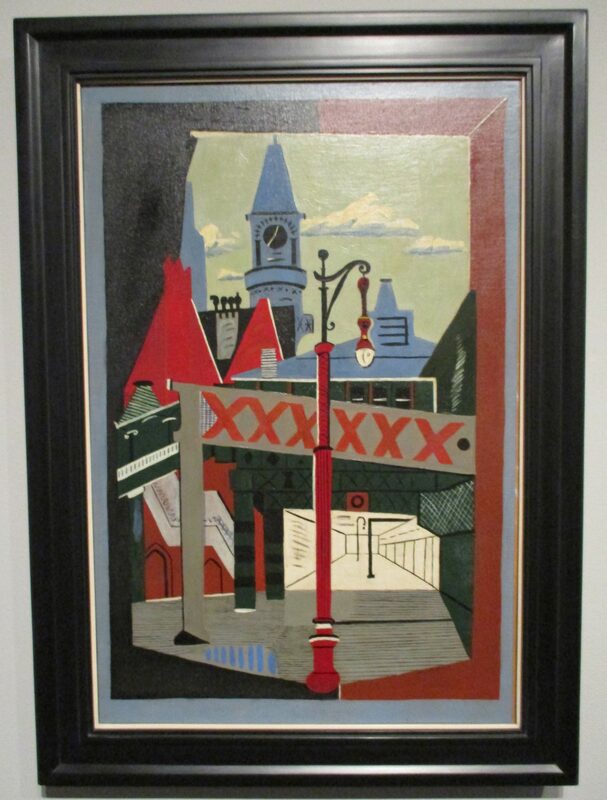 Davis compressed symbols of urban infrastructure into spatially complex, collage-like painting. The looming shadow of a taller skyscraper in the background portends New York’s continual urban transformation, a theme that Benton engaged in the City Building panel of America Today.